We offer 55 beds in 21 comfortable rooms and suites. 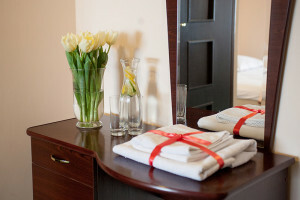 Each of our rooms has: a separate bathroom with shower, TV, telephone, free Internet access. Our cleaning staff cares about the cleanliness and freshness of the room every day to make you feel comfortable and pleasently during your stay. The room rate includes breakfast and a free car park. Since January 2017 you can find us on www.booking.com.